VPX is an extremely flexible and expanding set of standards and was designed to bring high-speed switched serial fabrics to defense applications. Alone among the major standards, it provides for liquid and spray cooling via its VITA 48/REDI section, which defines the mechanical interface for plug-in units and sub-racks to support them in addition to air and conduction cooling methods. The VITA 62 (Power Supply) section of the standard defines the mechanical interface and electrical performance of a power supply that fits within the 3U/6U Eurocard form factor. VITA 65 (OpenVPX) defines a standard set of profiles for connectors, communications protocols, utility, power, and thermal definitions. 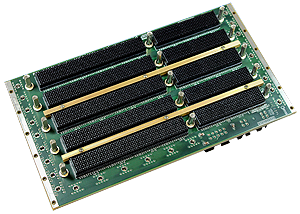 VPX is particularly well suited to high-bandwidth, data-intensive, real-time applications as well, including radar, electronic warfare, and electro-optical/infrared systems. Crucially, mixed VME/VPX/VSX backplanes are an option, resulting in a convenient upgrade path between VME and VPX. In addition, it remains for the moment the only major form factor that has introduced support for liquid and spray cooling. We design our VPX backplanes to function as part of a comprehensive, rugged enclosure ecosystem, with extended real estate to facilitate the connection of fan trays and power supplies, making major components pluggable and modular and eliminating unnecessary parts, components, assembly time, and additional manufacturing steps.